The Palau de la Música Catalana (Catalan Music Palau) is placed in the neighbourhood La Ribera in Barcelona (Street Sant Pere Mes Baix). It was designed by the Catalan architect Lluís Domenech i Montaner, it is part of the most representative buildings of the Catalan modernism. It was built between 1905 and 1908, the building hosts the headquarter of the Catalan choral society (Orfeó Català), founded by Lluís Millet and Amadeo Vives in 1891. Its construction was an order from the same choral society to make their social headquarter and was declared National Monument in 1971. 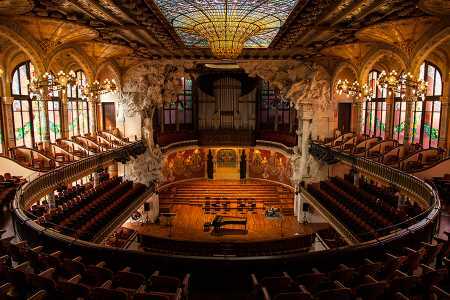 The 9th February 1908 it was inaugurated as an auditorium for concerts of orchestra and instrumental music. However, over the years it has hosted a lot of cultural and politic ceremonies, theatre plays, etc. Nowadays, due to its excellent acoustic the best international artists come there to perform; artists such as Richard Strauss, Daniel Bareinboim, Stravinski, Arthur Rubeinstein, Pau Casals or Frederic Mompou. On one hand, its concert hall, built in the patio in the solar party wall with the church to keep the same distribution and light in the concert hall as in the original construction. On the other hand, the auditorium is placed in the first floor, taking advantage of the different flight of steps for its easy access, leaving the ground floor for the offices of the Catalan Choral Society. In the facade we find different sculptures related with the world of music among the modernist and baroque architecture. The trencadís and the glass are present in all the construction. Inside the concert hall stands out. The big skylight by Antonio Rigalt i Blanch is placed in the top of the hall, it is a inverted sphere with golden glass in the centre and blue and white glass around representing female busts. In the stage 18 modernist muses dance in the walls with musical instruments and above them there is the great organ restored in 2003 thanks to the support and the opportunity to sponsor a tube.